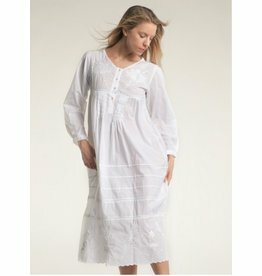 100% Cotton Nightgown. Long-sleeved, modified V-neck. Button yoke, button cuffs and pin-tucks front and back. Embroidery and scalloped edge at gown bottom and neckline. Machine washable.